Kevin G. Riley is the editor of the Dayton Daily News and editor-in-chief for Cox Ohio Publishing’s 12 newspapers and associated web sites. 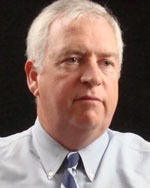 Riley was named editor in January of 2007. He had been deputy editor of the Dayton Daily News since September 2006, and served in many capacities for the newspaper since 1983, when he started his career as a copy editor. Former publisher of Cox Ohio’s Springfield News-Sun, Riley has also served as Internet General Manager for Cox Ohio. Riley has been named one of the industry’s “20 Under 40” by the Newspaper Association of America. He was also a member of the association’s Online Audience Development Committee and a mentor in its New Media Fellowship program. He has been a fellow at the University of Southern California’s “Transforming News Organizations for the Digital Now,” and he has attended Northwestern University’s “Digital Strategies for Media Executives” conference.